So much yarn, so little time. : nosy neighbour - that's me! 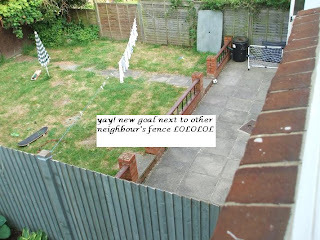 Did I mention how much the football banging on MY fence irritates me? Well, deciding it was my problem, not the next door kid's, today I bought him a goal - only a cheap one, from Woolies - and I've just been round to give it to his dad and explain. Sooooooooooo embarrassing, I'm shaking! But if it works, and he stops the incessant pounding on the fence, it will be the best £7 I've ever spent. update - well, the quiet didn't last long LOL after all he's only 5 but...the goal is now in pride of place next to his OTHER neighbour's fence - so my cunning plan DID work! Hi - my third attempt to leave a comment (you can tell I'm a Newbie at this). I Love what I would summarize as your "not-so-sweet-kids" (and/or parents) stories. And you a primary teacher :) Terrific! Your new Etsy shop is great - such lovely and adorable items. And your Blogs are as 'nifty' as your name (I'm still trying to get up the nerve to blog). Best of luck with your knits and your shop. thank you - that's so knid.